In spite of advances in digital processing components enabling direct digital conversion at higher frequencies, heterodyne architectures are still often required to meet stringent spur performance and tight blocking specs, or coverage over broad frequency ranges. All heterodyne systems depend on a frequency mixer to facilitate the frequency conversion and it is this mixer that often defines critical system performance. Radio Frequency (RF) signals are up or down converted to a different frequency by “mixing” the RF signal with a CW local oscillator (LO) frequency creating outputs at both the sum and the difference frequency of the two (fout = fLO ± fin). All mixers utilize non-linear devices such as diodes or FET transistors to accomplish the mixing and each type has its advantages in dynamic range, bandwidth and cost. FET mixers generally have higher IP3 than diode mixers for a given LO level but generally operate over narrower bands then diode mixers. Dual FET quad mixers have wider BW than single FET quad mixers but need more LO power and active FET mixers need external DC bias and could be a source of problem if DC is not filtered properly. Independent of the mixer technology, there are a number of parameters used to specify a mixer. These include Conversion Loss, which defines the ratio of the input to output powers, Isolation of an un-converted signal between any two of the ports, 1 dB Compression and Third Order Intercept Point which are almost always defined at the input to the mixers (versus the output as in an amplifier). 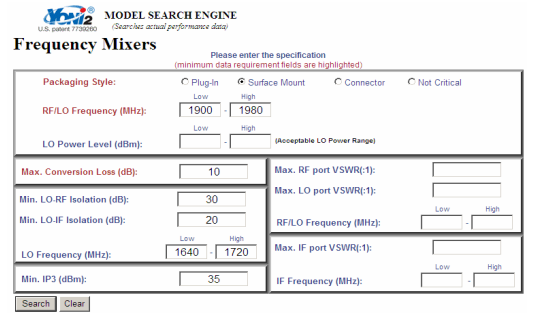 Additionally, there are parameters which are unique to mixers, mainly in regard to intermods produced as by-products to the desired signals such as + M x fin + N x fLO. Ultimately, what is most important is selecting the right mixer for the application. This follows a few simple, but important steps starting with the physical interface (connectorized or surface mount), the frequency plan and the LO level. The system architecture defines the Frequency Plan. From this plan the engineer determines the frequencies for all three ports (RF, LO and IF) with the convention that the IF port will be the lowest frequency port in either an up or down converter application (i.e. in an Upconverter, the input is supplied into the IF port). Once the frequency range of all three ports is defined, the engineer should determine the mixers’ LO Level. This is the level required to obtain P1 dB and IP3 performance that will meet the system requirements. The LO level is defined by the nominal LO power available to drive the mixers to achieve optimized performance, i.e. the highest P1 dB and IP3. In practice, the LO level can have a range of about ± 3 dB about this nominal level. Typically, the actual P1dB and IP3 performance are used to confirm that the LO Level of the mixer selected will meet the system requirements –The general rule-of-thumb for diode mixers is that the input power at 1 dB compression is roughly 5 dB below the LO level into the mixer while in FET based mixers, the input P1dB is equal to and often higher than the LO levels. Two-tone third order intercept point performance of the mixer typically falls 7 to 13 dB higher than the P1dB figure. 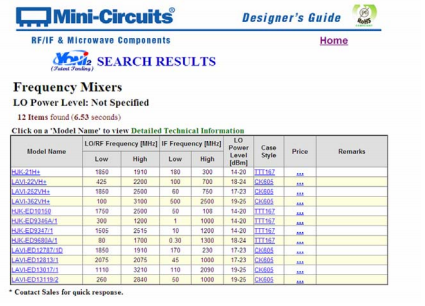 Both P1dB and IP3 performance are displayed in all mixer summary tables on the Mini-Circuits website with the ability to sort the listing for any given LO Level making the trade-study effort simple, and giving the engineer the ability to validate the LO Level selection quickly and thoroughly. In the end, all any customer really needs is a mixer that meets their system requirements over the specific operating range at the lowest possible cost. Typical websites offer searches of product line summary tables to narrow the product selection. That is good, but the best selection is one based upon actual data, not just catalog specifications. Mini-Circuits’ YONI search engine allows the user to search beyond a tables of specifications. The YONI database is built up from measured data taken on thousands of Mini-Circuits catalog and custom designs covering the full range of technologies, frequencies and LO levels. The search engine has access to the complete Mini-Circuits archive of designs and searches that database for matches against the customer specific requirements, aligning these requirements with the measured performance of all mixers in the database. This approach gives the engineer a distinct advantage: since the YONI search is across actual data, not just catalog specifications, the results are focused on performance over a specific operating band. This allows the engineer who needs a frequency range that is narrower than a standard catalog item, to see the performance over that range and then specify that item only over his band of interest. 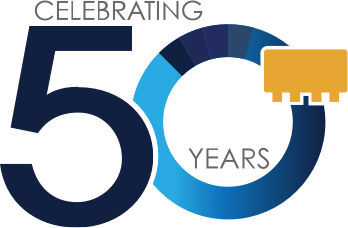 Catalog component specifications are almost always defined over broad frequency ranges with guaranteed specifications set to the minimum performance over the full range. For the engineer, this means sometimes having to sacrifice guaranteed performance over the specific range when purchasing a catalog part. With YONI, the engineer can focus in on the specifications and select from products that perform to their unique requirements. For example, if IP3 performance is critical, and the system is operating over a narrow frequency range, YONI will provide all the mixers that have measured IP3 performance over that focused band. The engineer can then review performance over the band of interest – enabling the engineer to purchase a catalog part over their custom specified requirements. Requirements are entered into the YONI search engine as shown in Figure 1. Reviewing the data on any mixer from these results shows that over the required range, it meets the engineer’s needs. 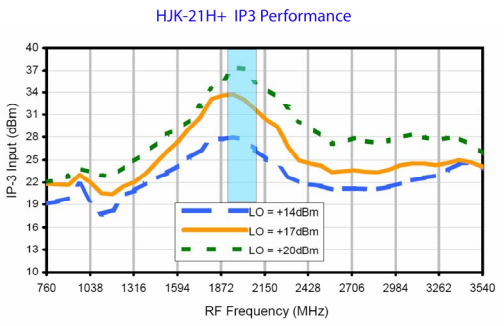 The data below reveals that even at +20dBm LO power, the HJK-21H+ will meet the +35 dBm Input IP3 requirement giving the engineer confidence that he can use the product in his system and meet his performance requirements. The YONI search engine is an extremely powerful tool making it possible for the engineer to select the right product based upon real data while not over specifying the requirement. This enables the customer to purchase a standard part over a customized performance range driving cost, and more importantly, value.